After 20 years of experience and success in geological and environmental fields, Ashton Bennett has recently extended its services to the geothermal or ground source heating. This has led to the launch of Earthtest Energy, which offers a totally comprehensive package of products and services to enhance comfort levels inside buildings and to dramatically reduce heating costs. Geothermal or Ground Source Heating is the key to these savings. The UK has a large diversity of geological strata from hard bedrock in Scotland through Coal Measures in the Midlands to Chalk and Alluvial sands and clays in the South, but it is the local variations, in some cases from field to field, which influence the economics of installing a ground loop and the thermal efficiency of the heat extraction. Different soils and rocks have thermal properties that can vary by a factor of 6 and the moisture content of the ground can further affect the thermal capacity and conductivity by a factor of 8. The thermal capacity and conductivity of the bedrock, together with its temperature which varies with depth, determines the length of the ground loop required. 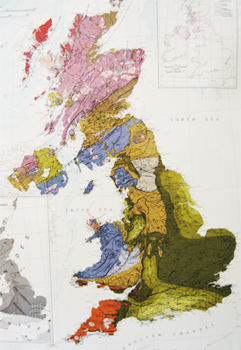 Ashton Bennett's Geology and Hydrogeology experience means that we are expert in interpreting the prevailing ground conditions throughout the UK and are able to design the most suitable economic and efficient method of heat extraction.